A castle town on the Japan Sea and next to a large lake. A short way out of town by bus is a river gorge with interesting rock formations and very interesting statues carved into the rocks. A long trip but worth it. From Okayama take the San-in Line to Matsue (about 3 hours). There is plenty of accommodation available. 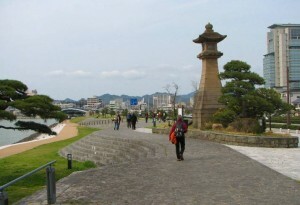 If you are in Matsue you might as well go to Izumo which is the next station to the west. About an hour by train. 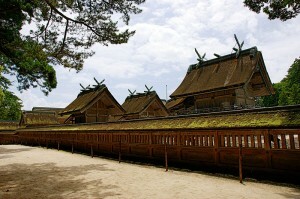 In Izumo there is a very ancient shrine which is very large and simple. A short bus ride away is a lighthouse with some wonderful views of the Japan Sea.